Rebel & Tony : 1980's Glam Wedding // Sandgate Town Hall, Brisbane. “So the wedding is 80’s themed, I’m wearing a wig and a tear-away skirt, my grandma is the flower girl and don’t tell Tony but I’m rollerskating down the aisle,” was the first description I got of Rebel and Tony’s wedding. Later on I heard about the bridesmaids’ Spice Girls medley dance number, the other grandma’s hula dance performance and, well, no one could warn us about the hoard of Santa’s that appeared out of a maxi taxi. I guess that’s the risk you take getting married in December. I already know that I will never see another wedding like theirs, and it was very hard to condense their photos into a blog sized post. After the big day they jetted off to Vegas to get married, again, by Elvis (because of course!) So grateful for Tony and Rebel for sharing this magical day with me. Remy : Lucky Fields editorial session // North Brisbane. I do most of my location scouting via Instagram, which brings mixed results. The below series is the outcome of the most serendipitous location scout to date. I had seen online that there was this particular spot with some cool coloured dirt, but when we got there (after it had just poured rain for the first time in months) she was no where to be found. Meaning, the cool dirt was now ~less cool~ mud. Determined that we could still make a thing out of this shoot that now had no location and no concept, we walked a little further past the recently deceased Instagram dirt spot. Suddenly we were on a bike track that went on forever up and down a wavy hillside, which was covered in beautiful long grass with wispy little tips and birds and wind and it was perfect! I took some clients back to this spot following our success, and ALL OF THE BEAUTIFUL LONG GRASS WAS GONE. So let this be a lesson in seizing every chance to take photos in pretty places when you can find them x. This portrait session really, I mean really took Kelly and I for a ride. She showed me some water nymph inspo and suggested we head to Gardners Falls or Kondalilla on the Sunshine Coast one Sunday. Upon arrival to both places, the cars were parked way up the road and around the bend and it was pretty clear we weren’t going to get the space and privacy needed to feel safe shooting in a wet, white dress… if you know what I mean. I dug deep into the recesses of my teenage mind to a spot I used to frequent in high school. All I remembered was that it was down a dirt road, with no signs and very close to a commune. With a little help from my Instagram friends I was able to narrow down the road name and somehow we found it! It was still the haven I remember it being and Kelly was the perfect subject to be the floating fairy / water nymph she envisioned. Very grateful I’ve snagged her as a repeat client, she’s such a beauty. These two have such a strong connection, so an awesome location wasn’t necessary but was certainly a bonus. As a Blade Runner fan girl I really appreciate all the neon and the colours and the hint of Japan in this set. Abby : Balloon editorial session // Brisbane City. Recycled balloons. A carpark. A stormy afternoon. I can always count on Abby to be down for any weird / vague / last minute concept I come up with. Turns out helium balloons are an electrical risk at train stations, so prepare to have a few concerned station masters after you if this is the prop you’re travelling with. Charlotte : Self love portrait session // Brisbane. A sweet little home session with Charlotte. Everything was going along normally until she asked if she could get a shot with her skeleton, Seymour, with whom she has a matching tinsel jacket. Because of course she does. Charlotte is such a unique gal and I had a lot of fun capturing this delicate side of her. Remy : Brisbane storm editorial session // North Brisbane. We were going to drive out west this day, but when Remy pulled up at my place the sky was turning black, so we thought it best to not drive too far with a storm coming. We huddled at a picnic table for over an hour, getting sprayed by the nearly-hail storm and wondering if it was going to end before the evening. This post-storm sunset was something else. There’s a lot of different looks in this series, mainly because the sky was insane and changing colours by the minute. This might be my favourite set ever, so much magic. Charlotte & Ben : Couple's portrait session // Chinatown, Fortitude Valley. Golden hour doesn’t get much better than this session with Charlotte and Ben. They have such amazing chemistry that direction from me was not at all needed. 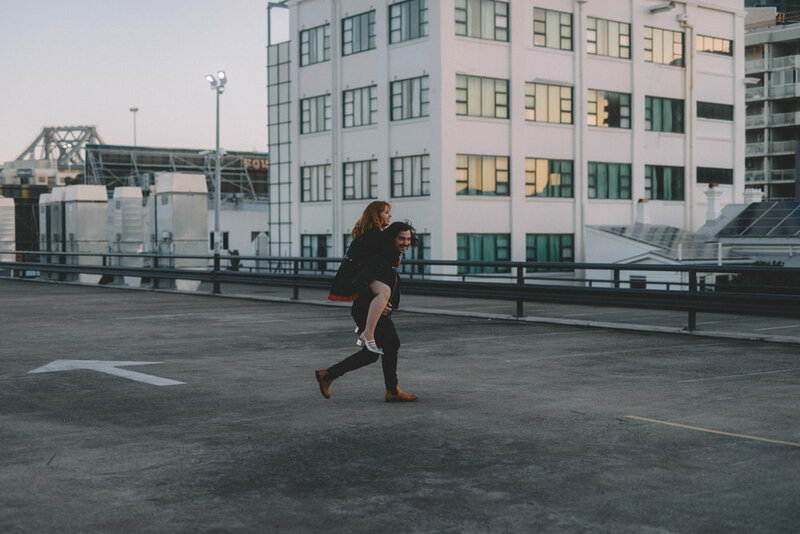 My personal favourite is the final few shots, when I jokingly told Ben to ‘take her for a ride’ and he literally zoomed off around the carpark and it was equal parts cute and hilarious. Please, more rooftop sunset shoots! Charlotte : Soccer club editorial session // Brisbane. Months ago on Instagram, I saw Charlotte post a picture wearing this dress and I knew we had to shoot in it. Those sleeves are SOMETHING ELSE. When I was driving through the suburbs to her place for the shoot, I went past a local soccer club that was the perfect match. I love a good happy accident. Bek & Cam : Adventurous couples' portrait session // Lamington National Park. Last weekend I ventured up the mountain to Lamington National Park with my good friends Bek and Cam. I met Bek on Tumblr about six years ago, she found Cam on there too. Safe to say they’re one of the best things to have come from the internet. 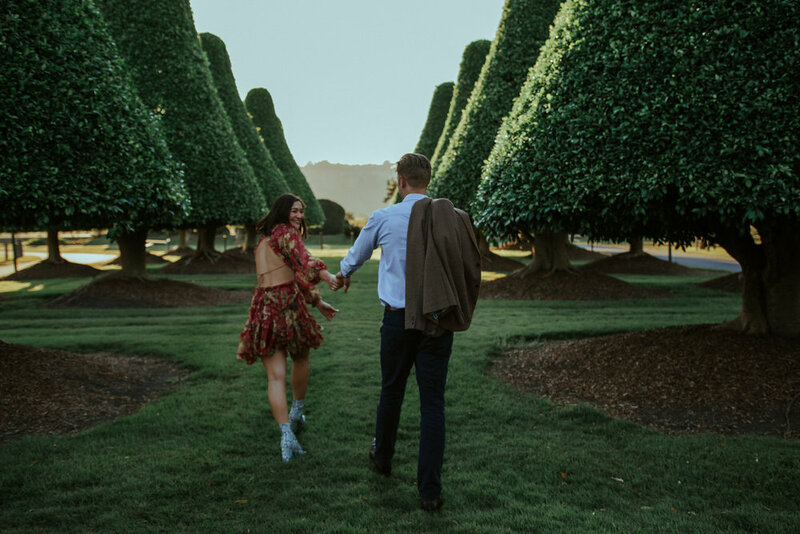 Jarrod & Thalia : Brisbane engagement session // Ekka 2018. Last weekend Jarrod, Thalia and I braved the crowds of the Ekka to create this magically colourful engagement session. This location was pretty hectic to navigate, but these guys are so much fun and really made the day special. I cannot WAIT to shoot their wedding next year (and possibly again sooner.) For now, enjoy these pretty neon portraits. Personal: Birthday self portrait session // Lennox Heads. Remy : Self love portrait session // West End, Brisbane. A Saturday afternoon well spent with a friend, some wheat and a lot of manual effects. I love this series very, very much and can't wait to work with Remy again x.
Nick & Jen were the best dancers at my wedding. My husband and I had taught ourselves a quick waltz via Youtube the night before, meanwhile these guys were out there spinning and grooving like pros. So there's a lot of dancing in this set, prepare yourself for all the twirls. Clients-turn-friends of mine manage this ridiculously picturesque crematorium in northern New South Wales. It's so beautiful that I am 100% willing to inconvenience my family by subjecting them to the 2 hour drive to cremate me here. Careful to ensure there were no services on this day (residual habits of a funeral coordinator hi hello) we spent an afternoon in the gardens. I assumed that the garden was the only thing to see but there was SO MUCH MORE. It turns out before it was a crematorium, this place was an outback themed restaurant that now stands as a semi-abandoned looking warehouse, and before that it was a train station, with the platform still in tact. Ash & Amy-Rose : Winter farm wedding // Redlands, Brisbane. I know wedding portraits are usually quite cohesive - they're shot in a single location so everything is the same colour scheme, mood etc. But that all goes out the window when your wedding is up the road from Daz, a man who, in his own words, 'likes to collect strange things.' Such things might include a church bell strung up in a gum tree, a giant fibreglass shark sculpture, an appropriately themed slogan or a froggy waterslide. The following set is the slightly-more-serious 'proper' portraits that I am IN LOVE WITH. Ruby & Travis : Pet portrait session // Brisbane City. Recently I enjoyed an afternoon in Ruby's gorgeous home to shoot some portraits of her and her lovely long boy, Travis. I've never really considered pet photography but this pair's connection is so pure and I was delighted to come out of this shoot with such a wholesome, emotional set. I remember when Ruby was preparing to adopt Travis (he's a rescue greyhound) and she loved him so much before she'd even taken him home. He's definitely one the luckiest of rescue pups around. I'm sorry this post is so long but I really struggled to cull these photos because this pair are just too sweet. Thankyou again for letting me into your heart and your home, Ruby x.
Ali & Daniel : Engagement session // Mt Coot-tha Gardens, Brisbane. Last weekend I had the privilege to spend an afternoon with Ali & Daniel. 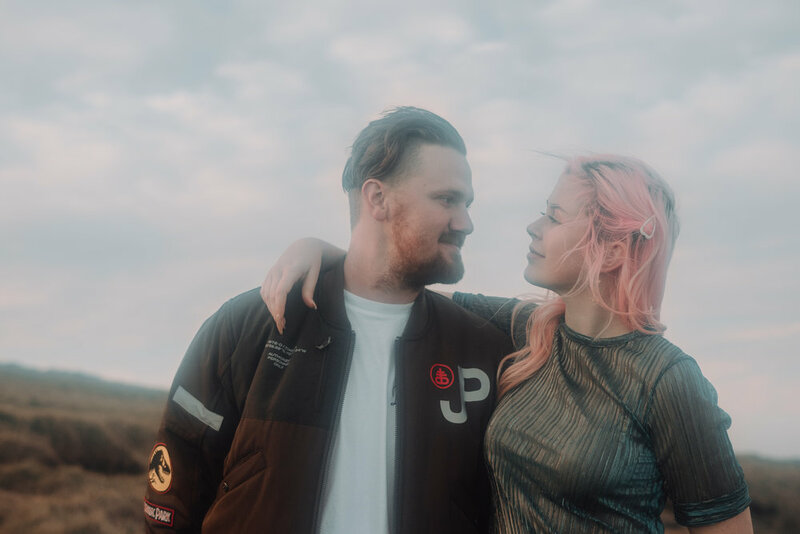 For a pair that have never done a photoshoot before their session turned out so so great - not to mention they're maybe the most attractive couple ever? If this is set is any indication, they're going to be so beautiful together on their wedding day later this year. Their adoration for each other just radiates. Here's some of my favourites from our afternoon goofing around in the gardens. Thank you guys so much for trusting me to create this special set for you x. Street portraits // Harajuku & Omotesando, Japan. Who thought it was a good idea to try their hand at approaching strangers for street portraits in an unfamiliar place speaking a language they're pretty sucky at? This girl. These pics are just for fun! Shot on my Contax T2 on Portra that went through airport x-rays many times (woops.) Even though these pictures aren't perfect, they're special to me and deserve a feature. I was tempted to include more street pics but I think I'll save them for their own post one day. Also shoutout to the boys and girls of Harajuku/Omotesando who are so shy at first but all know how to pose perfectly?? Enjoy. We held a bundle of tinsel close to Abby's face to achieve this streaky, watery reflection - because as you should know, Blade Runner is my inspiration for everything. I love the end results, even though the process was much less glamorous (scroll to the end of this post to see the reality of creating this look.) I am always thankful for Abby because she's so patient and trusting in my crazy stupid creative processes. It is also worth noting that during this shoot, while crouching in some mulch trying to ~get the shot~ I stood up too fast and absolutely knackered myself, falling over in front of a bunch of kids walking through the garden to a punk show. So congratulations to me.